I’m standing in the kitchen making risotto. I simply don’t know what else to do to fill this gap I feel myself wading through to get back to life here at ‘home’ after ten days of special time away. I want to fill this transition with something that celebrates all the time I have just spent in sacred space in some way. 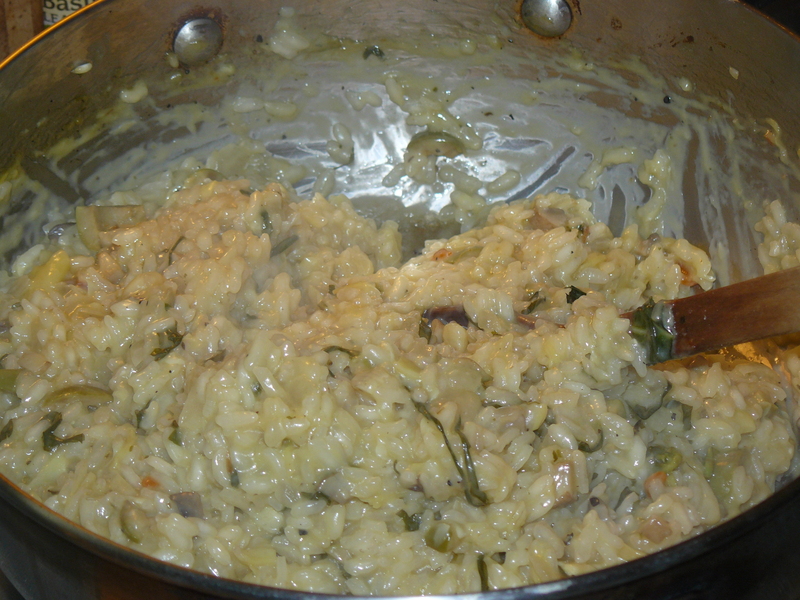 Being here in the kitchen feels right, and endeavoring to replicate the delicious pot of risotto made on the first night of my journey with dear female friends (spiritual sisters) comes to me with a certainty that this is exactly what is needed…. This overnight with my ‘sisters’ is on the way to a highly anticipated week of ‘Quilting by the Lake’. And where I usually arrive at our gatherings with a basket of goodies in hand to share and/or incorporate into a meal, this time my car is filled with baskets of fabric instead, along with all the other supplies I will need for my week at quilt camp. So when it is time to make dinner, our hostess simply empties her cabinet of items that could become a meal, including a bag of arborio rice and jars of marinated artichokes and olives. When I inquire if there is chicken broth and white wine, she produces a container of homemade broth from her freezer and several bottles of cooking wine. We decide to make risotto! In addition to these finds, there is onion and patty pan squash, fresh garlic and lemon juice, basil and freshly grated parmesan cheese. The spoon gets turned by us all at some point while I chop the next item to enter the pot while Julie prepares a tomato & basil salad. It is a memorable meal that marks for me the transition being made from home to quilt camp through a generosity of spirit I am so grateful to be able to participate in…. 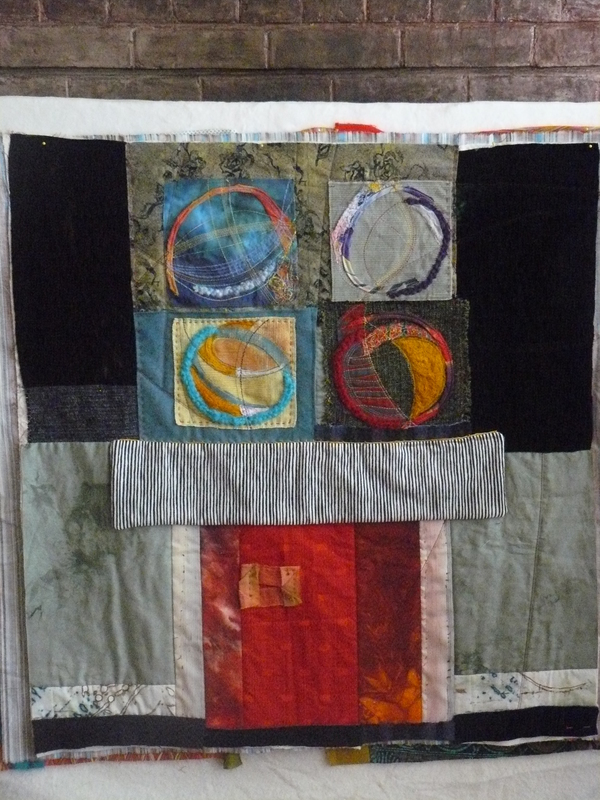 ‘Quilt camp’ is an annual re-connecting with like-minded creative souls. As an artist retreat, it is the week each year where total immersion into the world of fabric and color and design consumes and creates another kind of community filled with the generosity of spirit. I connect with friends old and new. This year is especially poignant, as Kathy (http://www.materialobsession.typepad.com/), my dearest friend of 45 years who lives half way across the world as the talented quilter and teacher and ‘patchwork’ shop owner that she embodies, is here teaching at QBL this year. I now get to experience who she is in all her glory and watch as she inspires and lights up the souls of her students and it is beautiful, her dedication to share ‘the promise of joy’ with everyone she comes into contact with. And I do what I do, taking a class that allows for entering into a flow that will take me to a new place, this year a class called ‘touch and tell’ with gifted South African teacher Rosalie Dace, and endeavor to make something that can be simply experienced with eyes closed as well as open. I never know what I will ‘make’ when I am here, and this year it is a piece called ‘Making Christmas’, still in process and holding all the love I feel for this work of making texture with fabric and thread. This week at QBL this year is also punctuated by sharing space both in and out of the studio with a group of women that soon begins to call ourselves ‘the tribe’, smile. Moving together from living room to studio and back, we discover a sweet and unexpected compatibility. It is such a gift to make new and lasting connections within an existing structure that allows for creativity to flow. I am home here and feel it in every way. And then, like a big giant cherry on top of the proverbial sundae, I leave the circle of life as we know it at QBL and head east to the new love in my life. Gary. Oh my. Carrying the energy of the week into the arms of this man I am falling in love with is just too delicious, if there can be such a thing! I soon remember it is ALL transition, all that is done, every connection made, every encounter experienced. Even coming ‘home’ to this familiar house that I know is just mine for a time is a transition, not a forever. Making the transition here is harder though for all the attachments that come with it. So here I am standing in the kitchen, making risotto to share with a rare night at home with my kids, Ben just visiting on a break from school, Molly just here temporarily until her return to Peru…. A medium chopped sweet onion is sautéed in olive oil in the 10″ wide, 4 quart stainless steel pot. Add a handful of chopped cremini mushrooms. Meanwhile, heat up a quart of chicken broth in a small pot on the stove and make fresh squeezed lemon juice to add. Molly is happy for the exercise of walking into town for a bottle of white wine so off she goes. I rinse two cups of arborio rice and set aside. Chop up the 8 oz. jar of marinated artichokes and about 1/4 cups worth of chopped green olives stuffed with pimentos. Slice a big handful of fresh basil into thin ribbons. Grate a bowlful of fresh parmesan cheese. When the sautéed vegetables are soft and translucent, add the rice and stir to warm and coat. With fire on medium high, begin to add the lemon chicken broth in ladles, stirring constantly, only adding another after the last has been absorbed. Stirring stirring stirring. 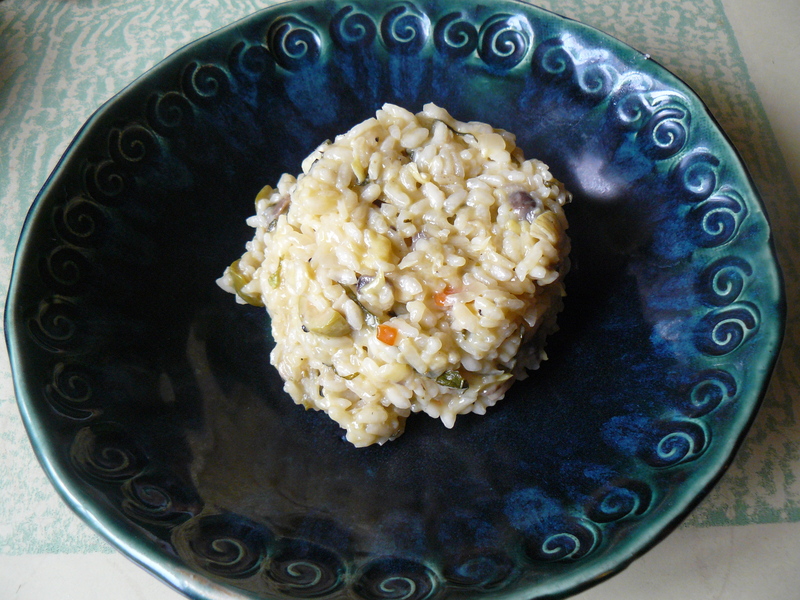 This is risotto. Adding things slowing, letting each ingredient become acquainted with and acclimated slowly with the contents of the pot. Molly returns with the wine, and I add that this time instead of the chicken broth. Then add the artichokes and olives. Stirring stirring stirring. More broth, more wine. The texture is beginning to change now. The rice is becoming risotto. There is no hurrying this dish. It will be done when it is done. Finally, the basil and a pour of organic half & half gets added. More stirring. Then at last the cheese, the whole bowl of it (or at least a cup’s worth), some fresh ground pepper, a little salt…. We made the blog! Rice turning into risotto — an apt metaphor for everything coming together beautifully, whether it’s your quilt, friends, or lovers. Glad to have you back. That piece is so serene, I like it very much. And I am glad that you had a good week at QBL. Wish I was in your shoes, sounds like a great change, and a way to recharge. Good for you.